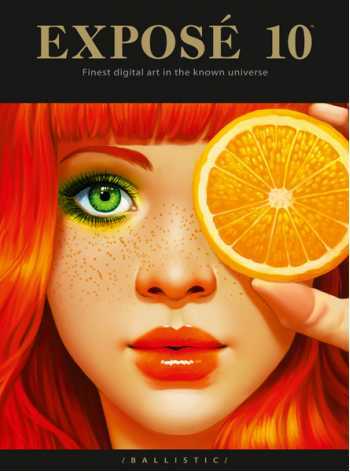 For the last decade, Ballistic has released the Computer Graphics industry must have, digital art annual: EXPOSÉ. The latest installment of the Finest Digital Art in the Known Universe brings together a record number of inspiring works from not only the giants of the entertainment industry, but also many rising stars. EXPOSÉ 10 is the largest EXPOSÉ to date with 288 pages, and features a record-smashing 548 images by 380 artists. EXPOSÉ 10 draws artists from every continent on Earth (except Antarctica), making it the most diverse collection of styles and cultural influences, and a true depiction of the worldwide digital art community. Ballistic has also, for the first time, included a commemorative Honor Roll that lists all of the artists that have been featured in all EXPOSÉ books from one through to ten. EXPOSÉ 10 - there is nothing else quite like it. EXPOSÉ 10 entries were judged into Master and Excellence classes by a judging panel of renowned artists including: Syd Mead (‘Blade Runner’, ‘Tron’, ‘Aliens’, and ‘2010’), Chris Perna (Epic Games Art Director), Stephan Martiniere (concept artist from id Software), Chris Sloan (award-winning Art Director from National Geographic), and Alex Morris (architectural visualization guru).